What if you could monetise a question? People ask questions all the time – and have millions stored away for appropriate moments. It’s why Google is a little company you may have heard a bit about. Yet as Google has grown, it has paradoxically become difficult to find a legitimate source of information, and even harder to find information which takes into account your own personal circumstances. Let’s face it, when you need personal advice or an expert opinion, Google doesn’t necessarily have the answer. But what if there was a Google-like platform, where, for a small fee, expert advice is readily at hand? That platform is Crowd Mobile (ASX:CM8) – which is capitalising on an urge as old as humanity – curiosity. 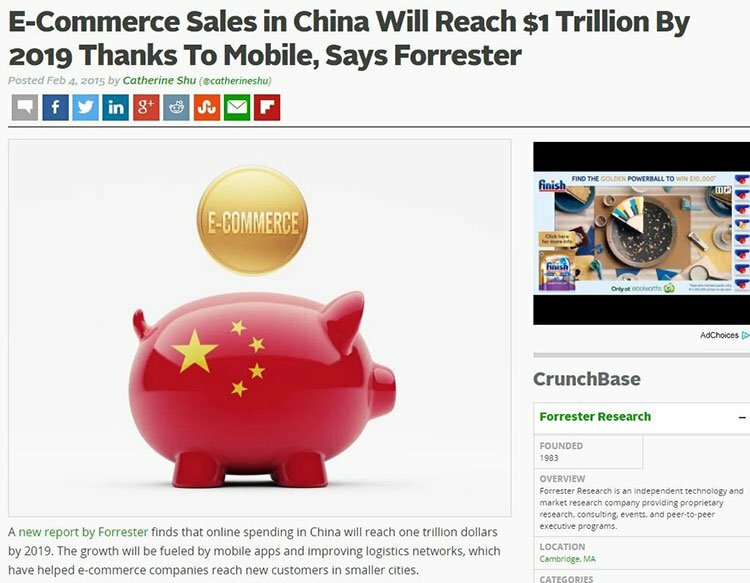 CM8 has just confirmed it is entering into the world’s largest e-commerce market: China. CM8 has recently signed a Letter of Intent with Chinese payments company SmartTrans that will give CM8’s Q&A products an easy entry point into the $1.1 trillion Chinese e-commerce market . With CM8 now able to leverage off SmartTrans payments platform, it can now move quickly to re-purpose, re-badge, and monetise its already successful Apps in that very large market. CM8 develops engaging ‘mobile first’ products that seamlessly connect those seeking answers with those qualified to give them – Q&A Apps such as Go to Court Lawyers, which complements its apps that supply (for a fee) qualified answers from fund manager Sequoia Financial Group and tax investment advisory firm CIA Tax. 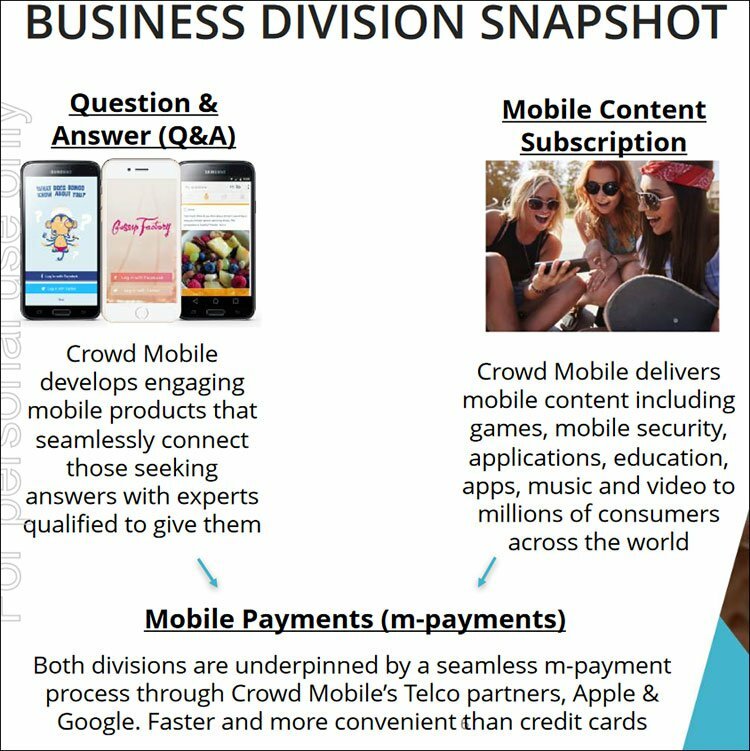 Through its Apps, CM8 is right at the intersection of macro-trends including the rise in smart phone use across the globe, the expansion of the global distributed workforce being led by companies such as 99designs and Freelancer (ASX: FLN), and the demand for personalisation and bespoke services. Again, why would you go to Google for a non-personalised response, when for a small fee, your question can be answered in a manner which is personalised towards YOU! When you think about CM8’s position in the emergence of these trends, it is little wonder that on the back of its growing suite of apps, it has managed to build a profitable business that generated approximately $4M in cash flow after paying interest in the last 6 months. So not only is CM8 positive at the EBITDA level, it is also generating strong free cashflow. Such is the strength of current figures that some analysts are predicting CM8 to grow by more than 10,000% in NPAT (net profit after tax) over the coming year. Please note however that this is just one analyst forecast and is not guaranteed to come to eventuate. CM8 is a speculative tech stock. Seek professional financial advice before considering this stock for your portfolio. As it builds its App arsenal, and grows into China, CM8 has also managed to secure a deal that enables it to refinance debt at a much lower rate and unlock shorter-term opportunities to allocate capital. The new $AU16.1M facility at the reduced headline interest rate of 6.25% (compared to 12% previously) will assist CM8 to grow the business and drive marketing initiatives. Finally, as a way to diversify its revenues, CM8 has a product subscription arm to its business that includes an ‘emoji pack’ with the number one paid app in nine countries. CM8 has managed to build a profitable, mobile-focused business to this point. But this could be just the beginning for this undervalued stock as it looks to secure more products, more experts and bigger profits. And its entry into China will no doubt assist there. We all have questions. They might be about finance or the sights to see when on holiday, or where to book your next Airbnb. And what do the majority of us do when we need answers? We engage the services of the Almighty Google. The problem with Google, however, is that many of its answers are vague and so we become trapped in a rabbit hole of links, that it could lead us down the wrong garden path. What may have started out as a specific question about a financial situation, leads to lost hours and a quiz about cats. Suffice to say, although Google has the most information out there and an incomparable algorithm, it struggles under the sheer weight of information available and can often give you every relatable answer to your question except the specific answer you want. Think about the last time you had a specific question about why something on your phone wasn’t working. We are guessing that you went to Google and found general advice on the manufacturer’s website, but became frustrated by the lack of information and headed to tech forums where you still struggled to find an exact answer. What if you could have a financial advisor, lawyer, tax practitioner, vet or doctor in your pocket? Well now that’s possible due to the advent of smartphones, and CM8’s technology. Crowd Mobile (ASX:CM8)’s core offering avoids the run-around by allowing you to search for the expert advice you need. What CM8 has under its purview is a series of products people can use to get personalised advice... quickly. Everything from financial advice to fashion is covered in its products – where a person pays a small amount to connect to an actual expert – who is then paid for their time. The user receives personalised advice or answers from an expert in the field rather than the anonymity of Google. CM8 has over 1000 experts on the books at the moment, and it’s adding more all the time. But how do you pay for 1000 experts to be on call just in case someone has a question? Somebody logs into a financial advice App – and simply asks their question with all the pertinent information. That question is then posted to the Crowd Experts ‘micro job platform’, which alerts a number of experts with access to the board. An expert then picks up the question and provides the answer (in his or her spare time). The user pays a small fee, a cut of which goes to the expert, and a further cut to CM8 for facilitating the exchange. CM8 now has over 1000 experts on the books in 50 countries across 30 languages. In fact, it’s down to minutes at last count. So normally a customer – if they wanted information the Almighty Google simply couldn’t provide – would need to book at least an hour with a professional to get the question they wanted answered. What CM8 does with its suite of Q&A products, which work across any phone or browser, is effectively plug the gap between idle curiosity and setting up an appointment with a professional. For the professional, it sets up another stream of revenue. One of the things which has come about as a function of the new ‘sharing economy’ (think Uber, Airbnb, Airtasker etc...) is that people are actively looking for ways to boost their side income. Once upon a time it may have been a case of doing a lot of legwork to set up these side-businesses, but now that’s being taken care of by the emergence of platforms to connect people with services, like CM8. What CM8 is doing is tapping into the desire for ‘micro jobs’ and ‘global workforce mobility’. Take its deal with Go to Court Lawyers for instance. CM8 recently signed up the legal service as one of its experts available to the public . It’s a smart bit of business for Go to Court, as it enables the monetisation of legal questions that people weren’t previously prepared to book hour long meetings with a lawyers to have answered. No longer are the little questions missed revenue opportunities. In fact it’s a win-win for everyone as the public have their questions answered for a small fee, the lawyer gets paid, and CM8 takes a clip. CM8 sees this space as a high-margin play. As it turns out, while curiosity may have killed the cat it’s making CM8 a fair bit of coin. It recently chalked up the tenth consecutive quarter of billed messages growth. It turns out that there were 2.6 million messages across CM8’s Q&A products in the last quarter. That means over time CM8 is becoming more and more popular – and at this point it looks to be building a fair bit of momentum. That’s been reflected in the revenue for the company to this point, and some of the projections analysts are putting out there. The above is from its latest half-yearly statement – and as you can see CM8 has managed to more than double revenue and almost double underlying EBITDA in a year. Due to listing rules it can’t really forward project too far into the future, but that hasn’t stopped DJ Carmichael from putting some pretty bullish projections into the marketplace. 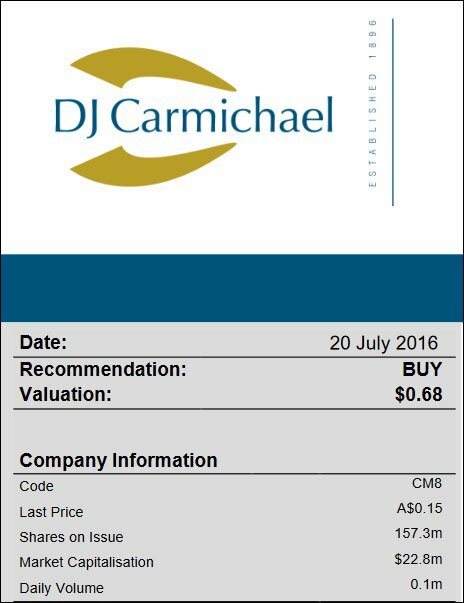 DJC has had a buy recommendation on CM8 for a while, and DJC analyst Michael Eidne recently slapped a valuation of 68c per share onto the company – that would be a gain of over 280% from current levels if it came to fruition. Now at this point we should remind readers that analyst price targets are no guarantee to eventuate, and never invest based on one analyst report alone. Given the market is currently valuing CM8 at 17.5c, clearly DJC is seeing something the market isn’t. 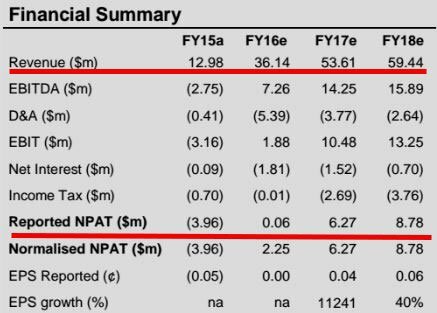 If DJC is on the mark, CM8 will treble its revenue in this year alone, and break even on NPAT. Going forward, DJC is forecasting CM8 to book over $6 million of NPAT in the current financial year – we’ve seen a fair few tech plays out there which would love to say that. In fact... that’s more than 10,000% growth in NPAT! A word of caution though – these are projections only and are not certain to come off. Do not base any investment decision on these numbers alone and seek professional financial advice. By signing a Letter of Intent with SmartTrans Holdings Limited (ASX: SMA) and its subsidiary SmartTrans Technology (Beijing), CM8 will effectively position itself and its Q&A apps in one of the largest e-commerce markets in the world – China. It means the figures we looked at above could be given a further boost, as Chinese consumers are quick to embrace mobile infotainment and entertainment products. In fact this is a market that research company Forrester says will be worth US$1TN by 2019. CM8 and SmartTrans have already spent the last 3 months localizing the Crowd Mobile products, which CEO Domenic Carosa said was the next logical step for a company already operating in 50 countries and 30 languages. CM8 is working with SmartTrans to establish a pilot program in the first instance, which will run for 3 to 6 months in specific regions across China, with SmartTrans CEO Bryan Carr confident that CM8’s products will be well received in the country. SmartTrans has agreements in place providing billing with China Mobile, China Telecom, China Unicom, UnionPay, Alipay and WeChat Pay and with the growing use of the smartphone as a billing device in China, the company has experienced significant uptake of its technology in that market. Through SmartTrans’ extensive network, CM8 hopes to have a big impact into the expanding Chinese e-commerce zeitgeist. And with infrastructure already in place to deliver its suite of products to this market, things are already looking positive for CM8’s bold expansion plans. Q&A is just one of the core pillars for CM8’s growth. It is also in the subscription game as a way to build some recurring revenues. CM8 offers mobile products on a subscription opt-in basis and an ongoing subscription revenue is booked – Anywhere between 15-65% of the subscription can be booked with CM8 itself. 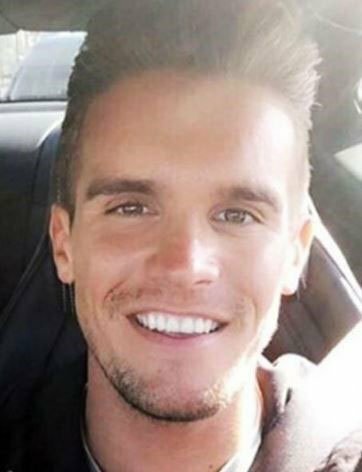 Who is Gaz Beadle, and what does he have to do with CM8? He’s one of the ‘stars’ of MTV’s #1 rating Geordie Shore. Think Jersey Shore, but with more North England accents. You may not know who he is, but luckily a whole stack of Crowd Mobile’s subscribers do, and they’ve been willing to open their wallets to get their slice of Gaz. 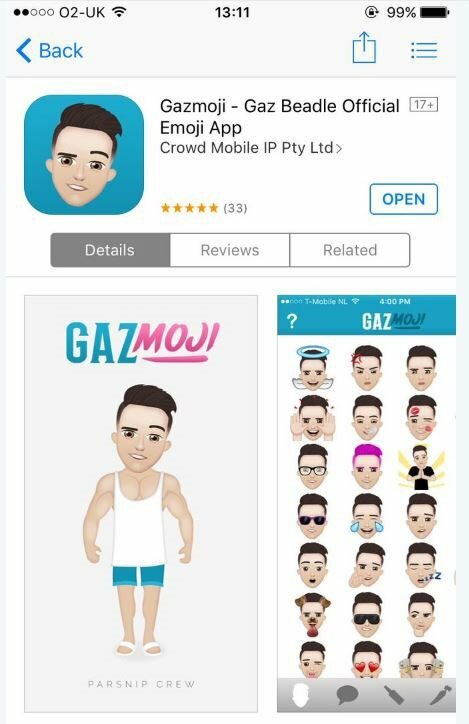 And by ‘slice of Gaz’, we mean emojis. As it turns out, the kids love both emojis and Gaz – so putting two and two together CM8 was able to ride the Gaz-train to revenue . The App, which is basically an emoji pack, was the number one paid app in nine countries. It may seem baffling, but it’s true. In any case, what this demonstrates is that CM8 clearly knows how to push out popular content, capture and monetise emerging trends before even some of the most nimble tech players out there. Last year CM8 moved to acquire a company known as Track Concepts , which has underpinned CM8’s subscriptions business. Based out of the Netherlands, it has provided the business the weight needed to scale up at rapid pace. Track Concepts owned specialist technologies in mobile payments, operated in over 38 countries – and had great relationships with telecommunications companies in those countries. In fact, Track Concepts had relationships with over 140 mobile carriers – and now those relationships are CM8’s. It was a smart bit of business which bought CM8 almost immediate scale and while there have been teething problems like any acquisition, the strategy is sound. With the final payment to the original Track vendors made at the end of June, CM8 is over the difficulties and it’s time for the full value of that transaction to come to the fore. In fact, in its latest release CM8 says that it “will begin to deliver returns in the 2017 financial year”. Here is CM8’s CFO Christian Shaw talking about debt refinancing and the company’s financial goals for FY17. Importantly, the Track acquisition also gave CM8 the underlying mobile payments intellectual property. Getting mobile payments right is a massive thing – and while it seems boring, having the IP to the underlying architecture of its business is vital. Normally, a company would need to invest significantly for the sort of m-payments infrastructure Track and subsequently CM8 has built. Track also brought a customer acquisition platform into the bargain – which turns out to be pretty important when running a business such as CM8’s. This isn’t anything CM8 has discussed and is merely speculation at this stage, so don’t take this as guaranteed and take a cautious approach to your investment decision. Having a stable mobile payments system in place in over 50 countries turns out to be the sort of thing that is quite popular at the moment. 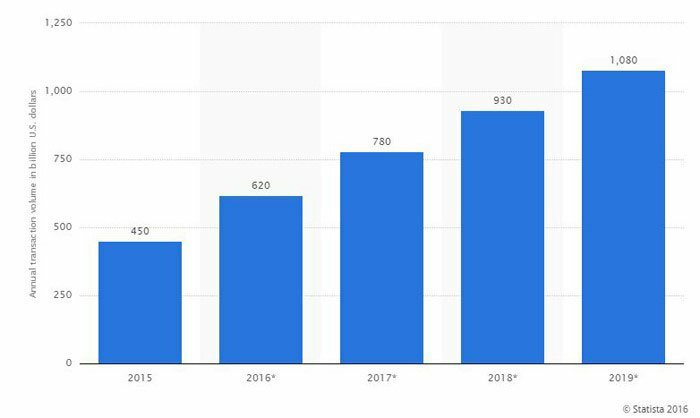 The following table reflects the total revenue of the global mobile payment market from 2015 to 2019 in US billion dollars. As you can see it is a large market and one well worth making a stand in – especially when it complements other facets of the business. Now, we’re not saying that there’s a willing buyer for a white-labelled m-Payments system, but what this clearly demonstrates is that people are using their mobiles to pay for things more and more. They’re even becoming credit cards. Suffice to say, having your m-Payments game on point is becoming vital. Prior to the end of June, CM8 had a bit of debt on its books as a result of its acquisition of Track and the general working capital needed to run an ambitious, fast growing tech company. That debt was an overhang on the business, and was charged at 12% – which is fairly high. At the end of June , it managed to swing a deal to re-finance its debt at a headline rate of just 6.25% – which we think you’ll agree is a vast improvement. If you wanted to get into the nuts and bolts of it, you can take a look at the video below – but if you don’t want to spend 45 minutes of your life going into the minutiae of a debt refinancing we’ll go through the broad strokes for you below. Essentially the new arrangement has a face-value of €11.8 million ($A17.6 million) and involves that headline rate of 6.25%. CM8 has also managed to push back a key payment to October next year, meaning that the principal can be used to pursue shorter-term opportunities. The reason the borrowings are in euros is that most of the company’s earnings are in euros – so it acts as a bit of a natural hedge. The kicker here is that CM8, at its election , can choose to meet monthly repayment through equity. It has publicly stated time and again that it intends to repay the principal and interest in cash – but the equity kicker gives the company a bit of flexibility if it wants it. The lender can convert all or a portion of the facility into equity if it wants – but this will be at a price set at 30% above CM8’s share price at an upcoming EGM. Shareholders can be nervous about that sort of arrangement, but we like to think about it differently. Imagine if a small company did a placement for more than $10 million at 30% above the company’s share price – it would be dilutionary, but it would be so at a huge premium. If a company managed to place $10 million of shares at a 30% premium, the market would take notice of that as a measure of confidence of the company to grow. Even that conversion of the facility into shares are subject to certain provisions which have been set by CM8 – so we this as a positive for the company. The important things to note here is that so far, CM8 has built a business that has analysts expecting a NPAT uplift of over 10,000% in the coming financial year. All in all, CM8 is a truly diverse business which has found the ingenious answer to monetising curiosity. It’s also shown some very clever financial footwork in recent times to re-finance its debt – leaving us pretty confident in management’s ability to swing a deal. Time to start asking some pertinent questions.